At this time of year there are already many bees busy in the garden but not yet many honey bees. The bumble bees are around, fat, noisy and fairly recognisable. 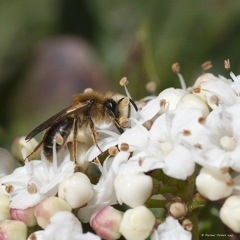 But there are also a lot of solitary bees. 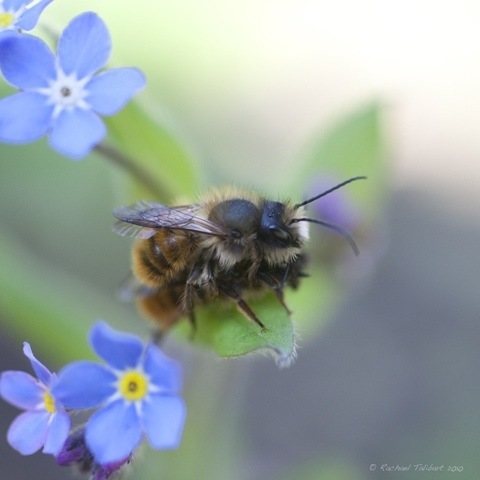 In Britain we have more than 250 types of solitary bee, bees that have single nest cells rather than communal hives. With so many types, I am not going to try to identify the subjects of today’s photographs. To know more, try here. Suffice it to say that solitary bees do have to get together occasionally to obey one particular biological imperative! 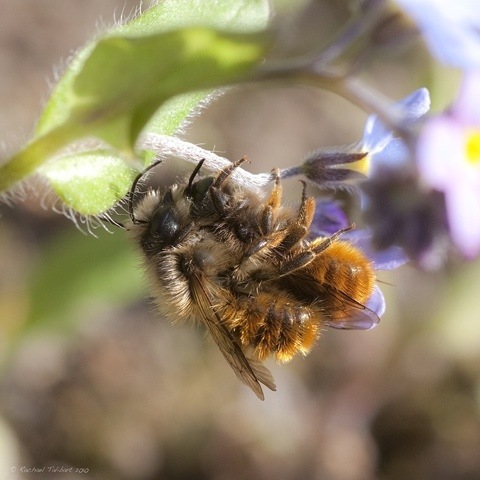 This entry was posted in garden, nature, photography and tagged bees, garden, insects, macro, mating, nature, photography, solitary bees, wildlife by Rachael. Bookmark the permalink. I’ve never really looked at a bee up close but these photos show how amazing they are. Keep posting those bees! Hi. Thank you very much! I promise to post some more bee pictures soon. Thank you for following my blog. Your support is much appreciated. No problem. Love the bees! “Caught in the act” so to speak, great shots Rachael and a lovely post. I just spent the last two afternoons post-work bent over blooming azaleas in a local park here in Korea, trying to “catch” bees in mid-flight with a “semi-macro” prime lens that only lets me get to about 6 inches. A loser’s game, but very absorbing, though I suspect many locals now associate ‘foreigner’ with ‘lunatic’. Much easier to look at your excellent shots! I think I read somewhere that species of native bee in Australia number in the thousands – yes, just checked, and one person says 1,500, another 2,000. European honeybees are a threat to them, and there is some kind of parasite endangering them now as well. Fascinating insects. Thank you for this lovely, long and interesting reply. I can empathise with your experience of photographing bees in flight as that has become something of an minor obsession for me. I fact, I might just make it the subject of today’s post. Thanks for the idea! Our bee population has been in decline in recent years. I think it is a global issue.